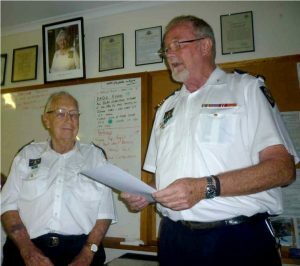 Home » Community • Featured » Coastguard member turns 90! During the month of January QF17 had 11 Marine Assists, 2064 man hours were clocked up and 1683 calls to the radio room. At the last meeting all members extended warm birthday wishes to Brian Morris who turned 90 in January. Brian is a valued member of Coast Guard Tin Can Bay, putting in countless hours as a radio operator, running stores and fundraising. Commander John Macfarlane presented Brian with a certificate of appreciation for his fundraising efforts. As Coast Guard relies heavily on community support and donations, people like Brian are invaluable to ensure ongoing operations. Remember safety first on the water.